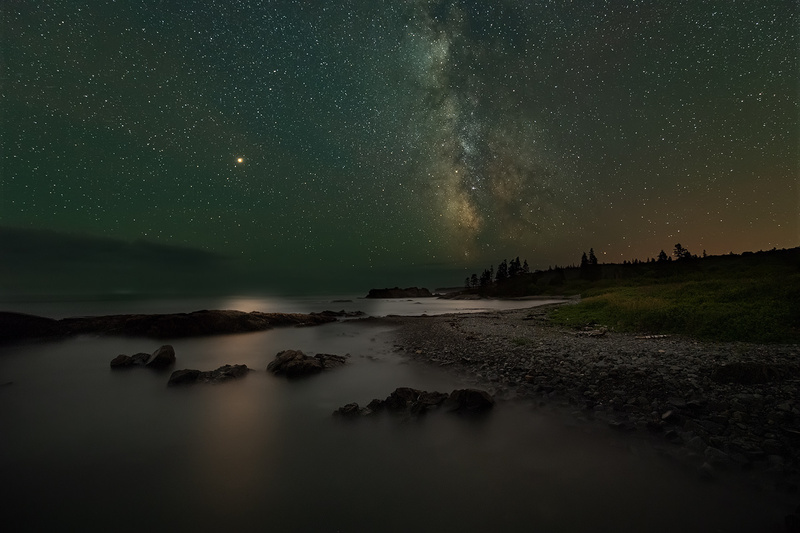 Recently, I had the pleasure of taking some photos up in Maine with the great Adam Woodworth. Although the weather in Maine wasn’t as co-operative as I would have hoped, we did get a short break on this particular night. We raced out to a spot that Adam has on his list of cool places to shoot. We set up our tripods on some jagged rocks bumping out into the water and shot away for as long as the weather held for. It was so dark there that the exposure for the foreground had to be separate. The foreground is an 8 minute exposure while the stars are 10 second exposures. It was so dark that I really couldn’t see the composition until after the 8 minute exposure was complete. I just pointed my camera and hoped. The bright star in the sky is Mars and you can see the clouds creeping in on the left side of the photo. Just shortly after this photo the clouds rolled in and we had to call it a night. But since I got this image, it was a really great night.